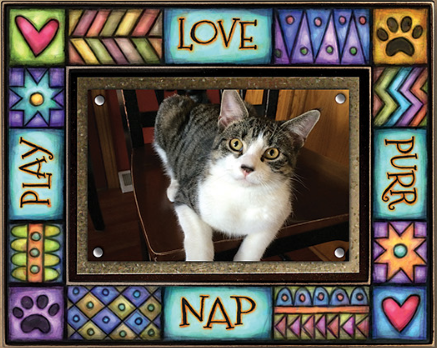 This frame features the artwork of Michael Macone of Spooner Creek with quote, "Love, Purr, Nap, Play." It measures 8" x 10" and holds a 4"x 6" photograph on a sheet metal square with four super-strong rare earth magnets. It is printed with archival ink on archival paper which is attached to wood and UV coated to last a lifetime. Frame can hang on the wall or stand on a surface using the included wooden peg.